-This month we had a visit from a physical therapist for an Early Intervention consult for torticollis. She said he looks alright and he doesn't qualify for EI. She gave us some exercises for his neck and scheduled a follow up appointment to confirm that he is getting better and not worse. -Around 13.5 weeks Lane started lifting his hear all the way up at tummy time (instead of just face planting and being pissed that he was on his stomach). -Lane still has blue eyes! -At 14 weeks we also had his first trip to the lake in Virginia. Just he and I went and we left around 7 am- he slept just about the entire 5.5 hour drive down! We stopped once briefly for a diaper change and quick feed and then continued on. -At 14 weeks Lane also started sleeping in the bassinet for naps and at nighttime (instead of the Rock n Play). 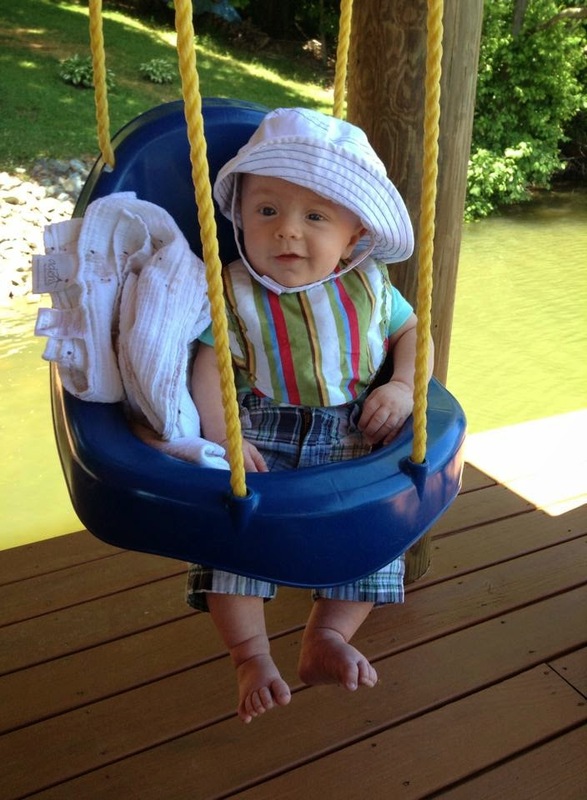 -This month Lane was wearing 3-6 month/6 month clothes.